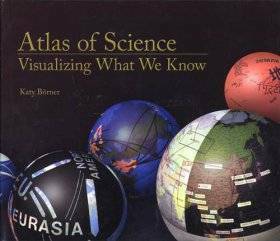 This graphic cover of Indiana University information scientist Katy Borner's 2010 Atlas of Science: Visualizing What We Know can illustrate the centuries and course of scientific progress. The author is also a leader in its revolutionary shift to worldwide electronic collaborations, much documented herein. This profound new stage may then take on the obvious lineaments of a global noosphere brain as it similarly scales and cerebrally organizes itself. And one hopes, as this website seeks to convey, that humankinder is coming to its own saving knowledge. With the realization that the natural world could possess regular, discernible properties instead of capriciousness, that these can be investigated, catalogued and codified, a Renaissance science and technology began its exploratory and empirical quest. This project necessarily engaged in quantification: to name, count, measure, test and arrange an incredible creation of atomic depth, celestial size and evolutionary duration. But with each expansion over past centuries, we human observers vanished into insignificance. This agenda led to philosophical consequences quite opposed to the original initiative. As nature was taken apart and reduced piecemeal, the world appeared more like a machine than an organism. A material, mechanical scheme took over which divorced people from nature, value, mind and spirit from matter. A first scientific revolution of the 17th and 18th century equated with natural philosophy and theology gave way to a second stage into the 19th century as it split into specialties and subdisciplines - biochemistry, neuropsychology, ethnobotany, solid state physics, and so on. This parcellation led to more isolation, the living realm was disassembled, dissected and embalmed. The endeavor to read sacred nature that began with promise has wound up with a cosmos of profane pointlessness. A reintegration began in the 20th century when quantum physics and relativity theory set aside a billiard ball model for a seamless, interrelated unity. This conceptual shift is still working itself out and lately percolating into biological and social realms. For most of its tenure science was concerned with infinitesimal particles and infinite sidereal reaches. By means of fast, networked computers and graphic visualizations, a “third infinity” of an oriented, recurrent, dynamic complexity and consciousness can be now studied and expressed. The section is called The Spiral of Science because in retrospect the reconstruction of how universe and human came to be proceeds from separate investigators to increasing dialogue and collaboration and onto our present worldwide, interdisciplinary community, noted next in Mindkind. Dark Energy Survey Collaboration. www.darkenergysurvey.org/collaboration-and-sponsors. A composite website for studies of Galaxy Clusters, Supernovae, Weak Lensing, Theory, Milky Way, Large Structure, Redshifts, and much more as an example of the 21st century shift and advance to collective worldwise scientific endeavors. Frontiers Journals. www.frontiersin.org. An online publishing venture begun in 2007 by neuroscientists to free their field from the time and space constraints and inhibitions of paper versions. The endeavor experienced such success that it has expanded into dozens of specialized Frontiers web journals for many other scientific areas. Some examples are Frontiers in Fractal Physiology (search Werner) and Frontiers in Neuroinformatics (search Kaiser), realms that might not gain a presence otherwise. An “Unbiased, Fair, Real-Time, and Interactive” peer process is in place, with dual anonymous and an editorial reviewers. The full text of all papers are available via Open Access. We quote from the mission statement of a typical journal. Frontiers in Bioinformatics and Computational Biology, a Specialty Section of Frontiers in Genetics, aims to publish research findings, methodology, opinion and hypothesis articles on all aspects of quantitative biology, with the emphasis on the molecular, cellular, organismal, population and phylogenetic levels; studies involving quantitative analysis at the ecosystem and biosphere levels will be considered until a better home for them emerges among the Frontiers journals. Specifically, Frontiers in Bioinformatics and Computational Biology welcomes papers that discuss i) analysis of amino acid and nucleotide sequences and structures; ii) analysis of large multidimensional numeric datasets, including gene expression readouts, gene and protein interaction data, metabolite and small molecule profiling, etc. iii) quantitative analysis of biological images; iv) phylogenetic approaches to biological questions; v) computational analysis of evolution of all life forms; vi) synthetic biology and biochemical engineering; vii) fundamental questions in the Origin of Life; ix) mathematical or statistical modeling of all of the above; and x) new or improved algorithms, software systems and online services dealing with all of the above. We welcome genome-scale and system-wide approaches. Mozilla Science Lab. https://science.mozilla.org. A fledgling site by the Mozilla group to help facilitate researcher, developer, and librarian collaborations to Maximize access to papers, data, code and materials so anyone can read and contribute. Its emphasis is on worldwide openness and inclusion. Anyone can become a Fellow (I would add a Mellow), participate in an event such as Global Sprint 2017 in June, either online or in person, or join a Study/Learning Group. Three women, Stephanie Wright, Zannah Marsh, and Aurelian Moser, with luminous creative credits guide the effort. Transforming Science: Mozilla Science Lab is a community of researchers, developers, and librarians making research open and accessible. We’re empowering open science leaders through fellowships, mentorship, and project-based learning. Mozilla: is a free-software community created in 1998 by members of Netscape. The Mozilla community uses, develops, spreads and supports Mozilla products, thereby promoting exclusively free software and open standards. Nature Scientific Reports. www.nature.com/srep/index. This is an online journal begun June 2011 with some 1100 articles by late January 2013, which span the physical, biological, medical, neural, and human sciences from cosmology to social networks. In our day of instant electronic publication and access everywhere, a true worldwide collaboration seems to be achieving its own cumulative knowledge and discovery. Our interest is to notice how many reports employ self-organizing, complex network systems by way of agents, nodes, entities in constant interactivity, which are then found to apply, almost word for word, in every stratified realm from galaxies to genomes, brains, and civilizations. In regard, typical papers about cosmic de Sitter spacetime, science dynamics, neural criticality, insect swarms (search Dmitri Krioukov, Xiaoling Sun, Jiangbo Pu, Douglas Kelley, in turn) and so on note that a pervasive presence of these related nonlinear features seems to implicate, indeed require, a universal, independent mathematical source. Many more periodicals such as Europhysics Letters EPL, Physica A, and Physical Review E publish akin work, often citing a statistical physics basis to report both exemplary and universal aspects. Online and open access, Scientific Reports is a primary research publication from the publishers of Nature, covering all areas of the natural sciences. Hosted on nature.com — the home of over 80 journals published by Nature Publishing Group and the destination for millions of scientists globally every month — Scientific Reports is open to all, publishing technically sound, original research papers of interest to specialists within their field, without barriers to access. With the support of an external Editorial Board and a streamlined peer-review system, all papers are rapidly and fairly peer reviewed to ensure they are technically sound. An internal publishing team works with the board, and accepted authors, to ensure manuscripts are processed for publication as quickly as possible. Amato, Ivan. Super Vision: A New View of Nature. New York: Harry N. Abrams, 2003. From Galileo’s telescope and van Leeuwenhoek’s microscope to an international collaboration today, through human endeavor the universe has gained the ability of sight. Striking, colorful images along with narrative reveal this achievement from subatomic particle tracts to molecules, diatoms, frozen lightning, landscapes and on to galactic networks which look like neural networks in a brain. Aung, Tin, et al. Genetic Association Study of Exfoliation Syndrome Identifies a Protective Rare Variant at LOXL1 and Five New Susceptibility Loci. Nature Genetics. 49/7, 2017. We note this paper about medical research findings to cure glaucoma and build a “disease biology” more for its almost 300 co-authors spread across every continent. With main bases in New York City and Singapore, a long list of credits such as King Saud University, Saudi Arabia, Shinjo Eye Clinic, Japan, and the University of Tasmania, Australia, a truly global network of visionary advances, fills two pages. Here is luminous evidence of a scientific ascent to a worldwide sapiensphere now learning on its bicameral own, which still remains unbeknownst to individual researchers. Baaquie, Belal and Frederick Willeboordse. Exploring Integrated Science. Boca Raton: CRC Press, 2010. A large, illustrated volume by National University of Singapore physicists wherein 24 chapters – Universe, Numbers, Energy, Atoms, Molecules, Fluids, Materials, Polymers, Electricity, Odor, Sound, Photosynthesis, Vision, Biopolymers, Proteins RNA, DNA, Information, Nano, Complexity, Evolution, Relativity, QM I, QM II –each pose a question to engage the reader. For example ‘Information’ asks how do children come to resemble their parents. And notably as a contribution from a non-Western milieu, an inherent self-organization is tacitly allowed which impels and informs an emergent cosmic vitality. Bainbridge, William Sims. The Evolution of Semantic Systems. Roco, Mihail and Carlo Montemagno, eds. The Coevolution of Human Potential and Converging Technologies. Annals of the New York Academy of Sciences, 2004. A Director of Information and Intelligent Systems at the National Science Foundation discusses the formation of a “cultural genetics” as a way to understand knowledge concepts and relationships in an evolutionary context. Ball, Philip. Triumph of the Medieval Mind. Nature. 452/17, 2008. Drawing upon his new book Universe of Stone: Chartres Cathedral and the Triumph of the Medieval Mind, (London: Bodley Head) the British science writer contends that the historic intellectual revolution of natural philosophy, whence the extant world can be understood as reliably comprehensible, a valid object of study sans capricious divine intervention, occurred firstly in the early 12th century, much before the Renaissance. Thus began the contentious dichotomy between faith and reason, given revelation and found phenomena, still unresolved to this day. Banzhaf, Wolf and Nelishia Pillay. Why Complex Systems Engineering Needs Biological Development. Complexity. 13/2, 2007. Computer scientists from the Memorial University of Newfoundland, and the University of KwaZulu-Natal, South Africa, contend that a more effective approach than prior top-down control and design is to draw upon natural evolutionary phenomena such as nonlinearity, self-organization, and adaptation which focus more on dynamically emergent processes than fixed, preconceived states. Bekoff, Marc. Redecorating Nature: Deep Science, Holism, Feeling, and Heart. Science. 50/8, 2000. An insightful editorial by the University of Colorado cognitive ethologist calling for a kinder, gentler sensitivity. Whereas we’ve certainly leaned much about nature, traditional reductionistic science often falls short because it fragments the world. Reductionistic science disembodies and dissects wholes into parts. What results are views of the universe in which dynamic, multidimensional interactions are presented as static, dimensionless flatlands. Beller, Mara. Quantum Dialogue. Chicago: University of Chicago Press, 1999. An historian of science describes how the establishment of a scientific paradigm, in this case quantum physics, occurs through constant argument between proponents of competing viewpoints. But the winner may not always have the best solution. The wave/particle complementarity of the Copenhagen school prevailed due to the conversational persuasion of Niels Bohr in dialogue with Albert Einstein, Werner Heisenberg, Wolfgang Pauli and others than to its mathematical basis. Beller then deftly shows that Bohr came to this theory because of its affinity to the ancient metaphysical analogy of microcosm and macrocosm and the yin/yang reciprocity of Chinese wisdom.